Last edited by clashmore_mike; 12-19-2018 at 07:13 AM..
Kelly and Long following him now. Recent Ohio St offer and Penn St sniffing. Dad played line at Pitt. ND sitting good with Olmstead & Carroll. Recruiting Tippmann from Ft Wayne Bishop Dwenger. ND might be forced to jump in here too. Hate to wast Phil's influence. 2019 is gonna be a crazy O line Class. A lot of top talent are really interested in ND. Pine-Richland junior OT hearing from Notre Dame. Notre Dame is tracking plenty of offensive linemen in the 2019 class, including a 6-foot-6, 255-pound prospect from a familiar program. Notre Dame has its eye on junior Andrew Kristofic of Gibsonia, Pa., an offensive tackle who protects Irish quarterback commitment Phil Jurkovec at Pine-Richland. 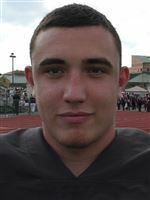 The Irish aren’t alone in their interest in 6-foot-6, 255-pound Kristofic, who holds offers from Akron, Buffalo, Indiana, Michigan State, Pittsburgh, Toledo, West Virginia and Wisconsin. Penn State is also in the mix and hosted Kristofic for a July camp and an unofficial visit on Sept. 9. The towering tackle is considering a trip to South Bend too. “Obviously, priority number one is my high school team but I would definitely like to get up to a (Notre Dame) game this year,” Kristofic said. “We looked at the schedule and obviously the USC game would be an awesome game to go to. Certainly, nothing is set in stone but that certainly stands out as a game I would be really interested in going up to. Kristofic attended a summer linemen camp at Notre Dame before his sophomore year. Kristofic and Jurkovec are close on and off the field. As a result, plenty of Notre Dame rhetoric has been passed to the junior from the four-star quarterback. “I’ve talked to Phil about Notre Dame and the recruiting process a bunch,” Kristofic said. 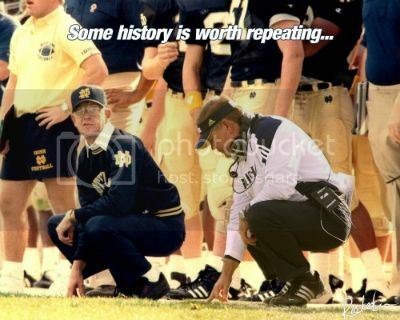 “Obviously, he’s always been extremely high on Notre Dame. I’ve heard about it through Phil on top of what I’ve already known. That’s been good. Pine-Richland defeated WPIAL 6A No. 4 ranked Penn Hills on Friday, 43-6, and has outscored its opponents 179-42 during 4-0 start. Kristofic noted a new edge to Jurkovec’s game that has allowed him to dominate this fall. Last edited by NDCrusader; 11-20-2017 at 07:03 PM..
Next year's OL and SDE/DT recruiting will be remembered decades from now. And before you ask... No, they won't sign a WDE. Phil's Teammate will be here.35th Nationally ranked tackle and 2nd ranked player in Pennsylvania. Coming for the January Junior Day.